This is located on Connaugh Street at the Cabra Luas Tram stop. Introduced well over 150 years ago by the novelist, Anthony Trollope, who worked for the Post Office in Ireland for several years, the letter box is an instantly recognised symbol of the Post Office. The intention was to make it easier for people to post their letters and make it unnecessary for them to have to wait for a post office to open. The first boxes appeared on the streets of cities such as Dublin, Belfast and Cork over 150 years ago and were subsequently introduced elsewhere. Irish post boxes have symbolic value. 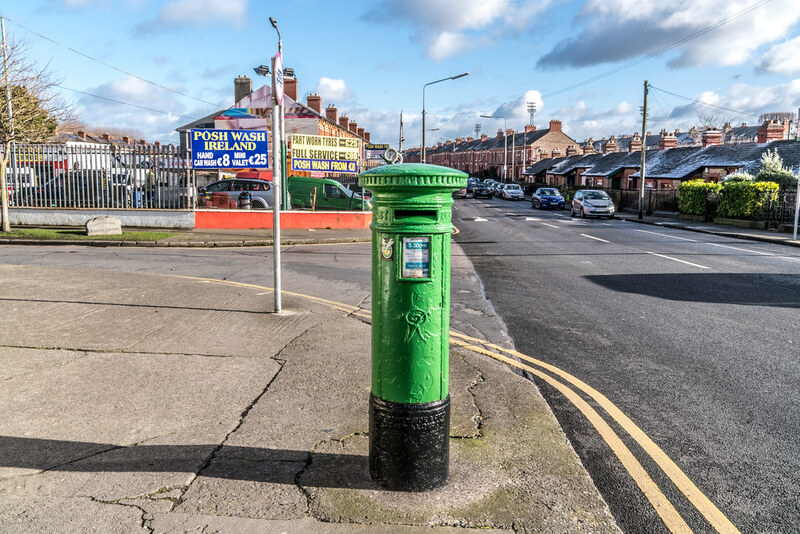 Before Irish independence post boxes were red but one of the first acts of the new Irish Government was to order that green would be the new colour for Post Office letter boxes. Sometimes a bit of red paint still shows through. The symbols of the past – in the form of crowns and royal insignia – take their place alongside the signs of independence – Saorstát Eireann, P&T and, of course, An Post.